Not going to lie, I think this is probably one of my most highly anticipated reads this year!! I seriously can not wait to read it. I totally agree about what you said about the romance- it looks like it's going to be very unique, and no love triangle is totally something to celebrate. Seriously, I can't wait until August 28th! 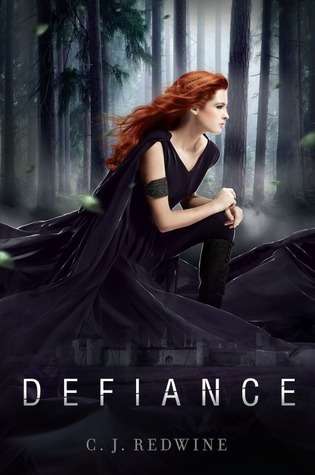 Even though it'll be my second day of school that day, I'm going to be dropping everything to read Defiance. I'm also now following your blog! It looks very well done, especially since you just started. My only suggestion would be to have a Google Friend Connect widget in your sidebar so you and others can see how many followers you actually have! =) Anyways, I look forward to stopping by frequently and getting to know you more! AHHHHH! I almost did this for mine to! I am ssosososososososososososososo excited for this book. Its one of my most anticipated to. And the cover is to die for! Great WOW! This book sounds simply amazing - and the cover is stunning. I've been seeing this book everywhere! Awesome pick! Great pick! I'm looking forward to this one, too. The cover kind of reminds me of the one for Hemlock, in that both girls are wearing purple and kneeling down. Yep this if definitely on my TBR, going to be a while before i can read it though as i'm cutting down on buying books at the mo especially when they are just released when they can be more £. New follower. This one sounds awesome. I do like the cover and synopsis. Come visit me if you get the chance. Great Pick! i cannot wait for this either! This is on my reading list, I wasn't aware though that it hasn't ben published yet. Talk about excited. LOL. Sounds like a good one, enjoy! I haven't heard of this one before. Love that cover! Great pick this week! I've heard some awesome things about DEFIANCE. I'll be reading my copy soooooon. I can't stinking wait for this one! Great pick!